I received a digital galley of this book with no expectations from the publisher, Simon & Schuster. This blog post contains Amazon affiliate links. If you click on them and make a purchase, I may receive a small commission. I loved Ruth Ware's In a Dark Dark Wood a lot and also really liked The Woman in Cabin 10. She has a wonderful style of writing for thrillers, interesting flawed characters who feel relateable, intriguing premises, and a knack of really giving you a sense of empathy for the characters you might not otherwise feel. There's a lingering sadness under the surface of all her stories, every single one! And I suppose that's part of why they are so attractive to me. 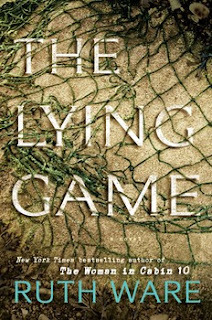 So I was excited for The Lying Game. A group of friends get a text that is both chilling and urgent. I need you, it reads. While they were friends in their youth, their adulthood has brought them along mostly separate paths until this point. We enter the story from Isabel's perspective. She's a young mother and full of dread at the prospect of going to meet up with her friends, but she does anyway. She has to. When she goes we learn the history behind the tight knit group of friends, the reason their friend has called them so urgently, the strains in their present life, and so much more. While the group harbors a secret, I feel that is uncovered fairly early. There's more to the story than that...another dark truth that threatens them all. I loved it! It's interesting as I was googling in preparation for writing this review I saw glimpses of extracts of other reviews. They were pretty negative, but I actually think it's Ruth Ware's best book yet. There's so much depth to it and the detail of how these women are living their lives and the feelings they experience matter. It's a thriller, yes, but it's also deeply human. This fantastic combination she has of really getting into the skin and heart of her characters and combining it with a mystery is what I love best about her books! The setting is also rich and atmospheric and contributed to my overall enjoyment of the book. And the story is about so much more than "the secrets." It's about our relationships to one another, growing up, cliques, and the secrets we keep and why. It's a pretty fascinating examination of love, friendship, and family. So I definitely recommend it, especially if you're read her other books and love them. As I got into this one, I suspected it was going to cement her status as a favorite author of mine and it did just that. So I definitely do recommend it to anyone looking for a good thriller with great characterization, some quotables, some mystery, and a good read.